Mother Jones Magazine has uncovered a new twist in the fight against the Keystone XL pipeline. As it turns out the authors who drafted the environmental review of the Keystone XL pipeline worked for TransCanada, Koch Industries, Shell Oil, and other oil corporations that stand to benefit from building the Keystone XL. Not only did the State Department know about these conflicts of interest, they redacted this information from public filings in attempt to conceal the truth. For background, the Keystone XL is a proposed oil pipeline that would ship sour crude oil from the Canadian tar sands to the Gulf coast of Texas. The oil would then be refined and shipped abroad. In order to build the pipeline, Transcanada, the company who proposed Keystone XL, must get the OK from the State Department. The State Department bases its decision on whether or not to approve the pipeline on an environmental review, conducted by a third party group overseen by the State Department and paid for by Transcanada. This review, called the "draft supplemental environmental impact statement" was released earlier this month. It has been widely criticized as downplaying the impact that building Keystone XL will have on the climate, and all but paving the way for approval for the project. The review was conducted by a company called Environmental Resources Management (ERM). When ERM released its review of Keystone, it also released a 55 page filing claiming that there was no conflicts of interest in writing the report. However, the State Department redacted information from this filing, including the biographies of key experts involved in writing the report. ERM's second-in-command on the Keystone report, Andrew Bielakowski, had worked on three previous pipeline projects for TransCanada over seven years as an outside consultant. He also consulted on projects for ExxonMobil, BP, and ConocoPhillips, three of the Big Five oil companies that could benefit from the Keystone XL project and increased extraction of heavy crude oil taken from the Canadian tar sands. A third worked as a consultant for Koch Gateway Pipeline Company, a subsidiary of Koch Industries. Shell and Koch* have a significant financial interest in the construction of the Keystone XL pipeline. ERM itself has worked for Chevron, which has invested in Canadian tar sands extraction, according to its website. However, this is not the first time that the State Department has been criticized for conflicts of interests involving TransCanada and Keystone XL. In October 2011, Obama's reelection campaign hired Broderick Johnson, who had previously lobbied in favor of Keystone, as a senior adviser. Emails obtained by Friends of the Earth, an environmental group that opposes the Keystone pipeline, revealed a cozy relationship between TransCanada lobbyist Paul Elliott and Marja Verloop, an official at the US Embassy in Canada whose portfolio covers the Keystone project. Before he lobbied for TransCanada, Elliott worked as deputy campaign manager on Hillary Clinton's 2008 presidential bid. Clinton served as secretary of state until recently. The question is, how can the State Department get away with routinely ignoring or burying connections between the oil industry and regulators responsible for Keystone XL? Photos by Alex Maclean, posted with permission from DeSmog Canada. Alex MacLean is one of America’s most famed and iconic aerial photographers. His perspective on human structures, from bodies sunbathing at the beach to complex, overlapping highway systems, always seems to hint at a larger symbolic meaning hidden in the mundane. By photographing from above, MacLean shows the sequences and patterns of human activity, including the scope of our impact on natural systems. 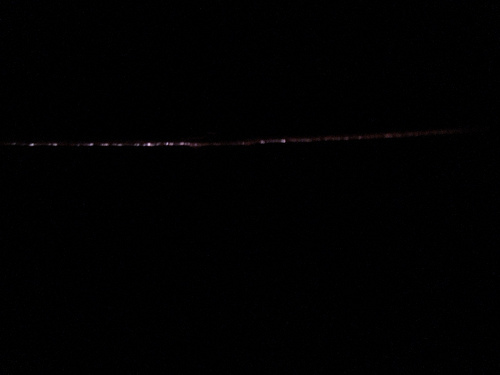 His work reminds us of the law of proximity: the things closest to us are often the hardest to see. Recently MacLean traveled to the Alberta oilsands in western Canada. There, working with journalist Dan Grossman, MacLean used his unique eye to capture some new and astounding images of one of the world’s largest industrial projects. Their work, funded by the Pulitzer Center on Crisis Reporting, will form part of a larger, forthcoming report for GlobalPost. DeSmog Canada caught up with MacLean to ask him about his experience photographing one of Canada’s most politicized resources and the source of the proposed Keystone XL and Northern Gateway pipelines. Beds leading up to tailing pond. DeSmog Canada: What was it like photographing the oilsands? Was it different from photographing other large-scale human spaces like highways or beaches? Alex MacLean: The oilsands covered a vast area of which I was only able to photograph part of. It was not only different from highways, beaches, etc., in that those are linear formations, but the scale of the oilsands area and the devastation to the landscape was overwhelming. I felt a relation between highways and the mines in that open pit mines and seismic exploration lines fragment the boreal forest just as highways do through urban areas. Steam and smoke rise from the Syncrude Mildred Lake mining facility. Patches of boreal forest intertwined with snow-covered muskeg, near McLelland Lake, Alberta, Canada. Clearing, dewatering, and seismic grid over the once boreal forest. Syncrude mining site, Alberta, Canada. Syncrude Mildred Lake mining site. View south to upgrading facility with rising plumes of steam and smoke. Alberta, Canada. Suncor Oil Sands Project. Piles of uncovered petrolum coke, a byproduct of upgrading tar sands oil to synthetic crude. "Petcoke" is between 30-80 per cent more carbon intense than coal per unit of weight. DsC: What led to your interest in the Alberta oilsands? AM: I have been photographing around the issues of climate change since early on, and actually put out a book looking at land use patterns as they relate to energy and consumption in 2008 called “OVER: The American Landscape at the Tipping Point.” I was drawn to photographing the pipeline because I feel as though there is little public awareness that, if built, the Keystone XL will make avoiding catastrophic climate change much harder. The pipeline is an important link in a fossil-fuel production machine, stocked with bitumen deposits at one end and refineries at the other. The public is unaware that this oil production machine is poorly regulated, though it will cause serious environmental and health effects on local, regional and planetary scales. Mining operations at the North Steepbank Extension. Suncor mine, Alberta, Canada. Checkerboard clearing of the overburden at Syncrude Aurora North mine site. Alberta, Canada. Seismic lines and well pad for exploratory drilling through the boreal forest at the Suncor Firebag Oil Sands Project. Alberta, Canada. Smoke, steam, and gas flares rise from the Suncor upgrading facility. Reclamation efforts seen to the right, on what was once a tailing pond. Suncor has reclaimed only 7 per cent of their total land disturbance. DsC: What is it like taking a bird's eye view of humanity? Do you sometimes have great insights looking at civilization from such a removed, abstracted position? AM: One of the interesting things about aerial photography is how so much of what you see about humanity is devoid of people. What I see is tracks and markings that are telling about our culture and values. When you see the destruction of landscapes, in this case of the boreal forest, with the obvious contamination of the environment via water and air pollution, you can’t help but feel that there is very short-sighted exploitation of natural resources that will have long-lasting environmental impacts. Hot waste filling tailing pond. Suncor mining site, Alberta, Canada. Earthen wall to tailing pond. Suncor mining site, Alberta, Canada. Growing pyramids of sulfur, a byproduct of upgrading bitumen. Mildred Lake, Alberta, Canada. DsC: You've been photographing 'human' spaces for a long time. Have you noticed a change over the last few decades in your perspective as society has grown more aware of the ecological crisis and the scale of our impact? AM: You can’t help but notice the growth that has taken place in the last thirty years, and the build-out of what was once natural spaces. I would say in the last 15 years, at an escalating rate, you begin to see more sustainable sources of energy through wind and solar farms, and reconfiguring of urban spaces to make them more walkable. Overview of tailing pond at Suncor mining site. Surface oil on tailing pond. Suncor mine near Fort McMurray. Open box cars carrying sulfur byproduct. Edmonton, Canada. * All captions provided by Alex MacLean. Image Credit: All photos copyright Alex MacLean. Used with permission. New internal documents obtained by the Center for Media and Democracy (CMD) reveal new methods that fossil fuel companies, agrochemical interests and corporate lobbying groups will influence certain state policies in the coming months through the American Legislative Exchange Council, or ALEC. ALEC's annual meeting is taking place in Chicago this week, just as Common Cause and CMD have filed a complaint to the IRS over ALEC's corporate-funded "Scholarships" for state legislators--ALEC is a tax exempt non-profit despite their mission of facilitating an exchange of company-crafted laws with state legislators in closed-door meetings. ALEC's Energy, Environment and Agriculture task force is drafting new model bills on behalf of its members like Duke Energy, ExxonMobil, Koch Industries and Peabody. ALEC's anti-environmental agenda in Chicago is available for viewing (see E&E PM and Earthtechling). These are the new model bills ALEC and its energy, chemical and agricultural interests are finalizing this week. The Market-Power Renewables Act and the Renewable Energy Credit Act: ALEC and other Koch-funded State Policy Network groups like the Heartland Institute haven't had much success with their attempts to repeal state renewable portfolio standard (RPS) laws through the ALEC/Heartland Electricity Freedom Act. The Market-Power Renewables Act and Renewable Energy Credit Act are two newer, more subtle attempt to weaken RPS laws by phasing in a renewable power voluntary program, creating space for existing and out-of-state energy credits to displace new clean energy, and eventually repealing the RPS requirements entirely. To slow the growth of clean energy competition, ALEC's fossil fuel members wrote these bills to allow increasing portions of a states clean energy generation requirements to be fulfilled by Renewable Energy Credits, or RECs. RECs are allowed to qualify in some states' RPS laws already, often in limited amounts, and they are not created equal. For instance, the benefits of burning gas leaking from landfills--something waste management companies would be selling anyway--are not on par with the societal benefits from building new sources of clean energy and displacing older, dirtier sources. You can see why ALEC member companies like American Electric Power or Duke Energy may take issue with this, given their reliance on coal and gas electricity generation. Increasing the amount that RECs can qualify for state RPS targets means allowing more out-of-state energy. This could displace in-state jobs and economic benefits from clean energy development. The RECs may also come from sources that aren't defined as "renewable" in some states' RPS laws, or are only allowed in limited amounts, such as hydropower, biomass or biogas, creating a lowest common denominator effect. At the end of any given year, the ALEC bill would allow states to bank any extra energy generated from RECs beyond what the RPS law requires and use them to meet RPS targets for the following year. This could continually delay the growth of new, clean energy. Resolution in Opposition to a Carbon Tax: Despite support for a carbon tax from ALEC members like ExxonMobil, ALEC is creating a model bill to weigh in on what will become the keystone policy battle for climate change science deniers, a battle that is already creating a rift among conservative groups, like the Koch-funded Heritage Foundation and the Heartland Institute against the R Street Institute. R Street formed when Heartland's Fire, Insurance and Real Estate program split away last year, after Heartland's insurance company funders were uncomfortable with the group comparing those who acknowledge climate change to the Unabomber. Pre-Emption of Local Agriculture Laws Act: This bill would prevent governments under the state level (cities, towns, counties) from creating new laws or enforcing existing laws that have to do with the regulation of seeds and seed products--ie crops, flowers, and pretty much all food products grown in a state. This would allow companies like Monsanto (indirectly represented in ALEC through its membership in CropLife America, an agrochemical front group and ALEC energy task force member) to bottleneck regulations of their GMO seeds and products at the state government level and stop community resistance to their abusive patent laws and enforcement through lawsuits. For examples of what ALEC has already been busy with this year, check out PR Watch's roundup of 77 anti-environmental ALEC bills that have popped up in state legislatures in 2013, supporting the Keystone XL tar sands pipeline project, rolling back renewable energy incentives and making it illegal to document animal abuse, among other issues. More info on ALEC's broader corporate agenda can be found on ALEC Exposed. Since it was first proposed in 2008 the argument for building the Keystone XL pipeline, which would pump tar sands crude oil from Canada to the Gulf coast for refining and export to foreign countries, has had some major holes. Literally. If approved, Keystone will pump a super-heated mixture of tar, sand, and chemicals from the most carbon polluting oil development on earth, while the effects of global warming manifest themselves across the country and the world. In order to mine and refine tar sands the oil industry must burn 1 barrel of oil for every 3 barrels of oil produced, a marvel of inefficiency. The potential builders of the Keystone XL have been caught in scandal after scandal in their attempts to get government and popular approval for the pipeline. The last few months have revealed the lengths that TransCanada (the company building the pipeline) and other Keystone proponents will go to secure approval for Keystone. But how would the State Department know how close the pipeline runs to water sources without knowing where the pipeline will run? 2) The private contractors hired to gauge the environmental impact of the Keystone XL for the State Department work for TransCanada and other oil companies that would benefit from building the pipeline, a major conflict of interest that the State Department tried to hide. "Air-quality tests commissioned by a Delaware City citizens group show a jump in local chemical, soot and sulfur levels after the opening of the Delaware City refinery, with at least three toxic pollutants exceeding some public health limits in one spot a mile from the plant"
3) Obama Administration insiders have significant ties to TransCanada, which the company has tried to exploit. The Financial Times has found that Alberta made a point to hire former Obama officials and Kerry staff in order to win approval from the State Department instead of focusing on Congress like most lobby groups. TransCanada and Alberta’s lobbyists have been trying to convince the administration that the pipeline will create jobs and pose no threats to the environment, in the hopes that they can get the pipeline approved. David Goldwyn, an aide to Hillary Clinton, was something of a mole for TransCanada, coaching the company’s executives on how to win favor at State with “better messaging.” After leaving the State Department, Goldwyn testified before Congress in favor of Keystone XL. These latest 3 scandals are just the most recent examples of the extent to which TransCanada and other Keystone XL boosters have manipulated the approval system in favor of the pipeline. Help stop the Keystone XL and protect the families and water sources in it's path by telling President Obama not to approve pipeline. Sign the petition here. Written by Nick Surgey, crossposted with permission from PR Watch. In October 2012, nine U.S. state legislators went on an industry paid trip to explore the Alberta tar sands. Publicly described as an "ALEC Academy," documents obtained by CMD show the legislators were accompanied on a chartered flight by a gaggle of oil-industry lobbyists, were served lunch by Shell Oil, dinner by the Canadian Association of Petroleum Producers, and that the expenses of the trip were paid for by TransCanada and other corporations and groups with a direct financial interest in the Alberta tar sands and the proposed Keystone XL (KXL) pipeline. Among the nine legislators on the tour was the new ALEC national chairman, Representative John Piscopo from Connecticut, and Senator Jim Smith from Nebraska who has sponsored legislation in his state to speed up the building of the Nebraska segment of KXL. Email records obtained by CMD show that after the trip, legislators were asked by ALEC to send “thank you notes” to the lobbyists for their generosity in Alberta. Far better than a mere "thank you," Rep. John Adams from Ohio returned from the trip and sponsored a bill given to him by a TransCanada lobbyist calling for the approval of KXL. As previously reported by CMD, similar legislation, reflecting both an ALEC “model” bill and language taken from a TransCanada set of talking points, has been introduced in seven states in 2013. The tar sands of Alberta are estimated to be the third largest reserve of crude oil on the planet. But the process of turning the tar-like bitumen into a refined product that can be used as fuel is extremely energy intensive and highly polluting. The former NASA scientist James Hansen, warned that the extraction and use of Canadian tar sands would mean "game over" for the climate. TransCanada is the operator of the proposed KXL pipeline, which would carry the tar sands to Texas for processing and likely for exports to markets abroad. Officially, ALEC organized the Alberta tour as an "ALEC Academy." In ALEC’s description of corporate sponsorship opportunities, this type of event is described as being "an intensive, two--day program for legislators that focus on a specific area of policy." It comes with an $80,000 fee to sponsor. Unofficially however, and made clear to legislators on the trip in emails from ALEC obtained by CMD, the expenses were paid for by lobbyists from the oil-industry and by the government of Alberta. In an email sent to Ohio representative John Adams ahead of the trip, ALEC staffer Karla Jones reassured participants that all transportation, accommodation costs and meals would be paid for. According to a copy of the trip itinerary obtained via a public records request, legislators flew into Alberta on Tuesday October 16, 2012, and were met by TransCanada lobbyists who took them on a tour of their facilities in Calgary. TransCanada, which is a member of ALEC, sponsored ALEC’s Spring Task Force Summit in Oklahoma City in May 2013, alongside other corporations with tar sands interests including BP, Devon Energy and Koch Industries. TransCanada’s Vice President Corey Goulet presented to legislators at the conference during a session called "Embracing American Energy Opportunities." Dinner on the first night was at the up-market Ruth’s Chris Steakhouse in downtown Calgary, paid for by American Fuel and Petrochemical Manufacturers (AFPM). The dinner included a presentation to the captive audience of lawmakers from AFPM about Low-Carbon Fuel Standards (LCFS), a mechanism designed to reduce the carbon intensity of transportation fuels. As CMD has reported recently, LCFS is considered a real threat to the tar sands industry, because it might restrict the U.S. market for fuels derived from the tar sands. AFPM, which has funded one of the other groups on the tour – the Consumer Energy Alliance (CEA) – to work to oppose LCFS legislation, would successfully sponsor an ALEC "model" bill on this issue just weeks after the trip, called "Restrictions on Participation in Low-Carbon Fuel Standards Programs." On Wednesday morning, after breakfast at the hotel, legislators were taken to the airport where a private charted plane was waiting to fly them around a number of different tar sands operations. Accompanying the legislators and ALEC staffer Karla Jones, were lobbyists from AFPM, TransCanada, Devon Energy, CEA, Shell Oil, and the Government of Alberta. The flight was chartered by the Alberta Government, at a cost of $22,000, with the costs split evenly between them and another unknown entity. During the day, legislators toured facilities owned by Shell – which also provided lunch – and Devon Energy, where they viewed the massive "Jackfish" tar sands projects. At these facilities, Devon utilizes Steam Assisted Gravity Drainage (SAGD), an energy intensive process that injects steam into the dirty bitumen to access otherwise inaccessible deposits too deep for mining. This process is expected to open up further areas of Alberta for tar sands extraction, including by Koch Industries subsidiary Koch Exploration Canada which has a pending permit request in Alberta to utilize SAGD. Dinner on Wednesday night was served at the Petroleum Club, sponsored by the Canadian Association of Petroleum Producers. On the Thursday morning, just before their return flight, legislators did have a brief meeting with a representative from the Pembina Institute, an Alberta environmental group that calls for responsible exploitation of the tar sands. According to the ALEC trip itinerary, this was to "provide the opposing point of view." Although Pembina does represent a different view from those that want completely unrestrained extraction of the tar sands, the group is not representative of those that oppose tar sands extraction. There are plenty of organizations that could have provided alternative viewpoints, particularly first nation tribes who are campaigning vigorously on this issue, but perhaps unsurprisingly they were not included. Even Pembina’s - somewhat limited - opposing voice was not wanted during the tour of the oil sands facilities, and they were not invited to the lobbyist-sponsored dinners. A month after the trip, the Director of International and Federal Relations at ALEC, Karla Jones, sent participants an email helpfully reminding them of what each industry lobbyist had paid for on the tour. CMD obtained a copy of that communication via a public records request, which included a spreadsheet containing the names, telephone numbers and mailing addresses of each of the lobbyists on the trip. The ALEC email also prompted legislators to send each of the sponsoring corporations a "thank you note." The phenomenon of ALEC legislators sending such letters to lobbyists is something CMD has previously reported on. Ohio Rep. Adams, for example, sent at least a dozen letters to corporate lobbyists in 2010, thanking them for writing checks to the ALEC scholarship fund, which paid his and his colleagues way to an ALEC conference. "Because of your help and others like you, the trip to ALEC was made possible for our legislators," Adams wrote to AT&T lobbyist Bob Blazer. “Rather than sending thank you notes to their corporate lobbyist sponsors, these legislators should instead consider an apology to their constituents,” Stephen Spaulding, Staff Counsel for the good government group Common Cause told CMD. "I doubt lobbyists want thank you notes in return for bankrolling legislators' international vacations – they would rather a bright, shiny souvenir in the form of corporate-drafted legislation." After the trip to Alberta, Rep. Adams, the Assistant Majority Floor Leader and Ohio ALEC state chair, led the calls in Ohio for the approval of the KXL pipeline, sponsoring a bill (HCR 9) and talking publicly about the proposed pipeline. "It is of the upmost importance that we strongly urge the U.S. government to take the necessary steps towards operation of the Keystone Pipeline," Adams wrote in March 2013 while promoting his bill. Rep. Rosenberger, the other Ohio legislator on the ALEC trip to Alberta, accordingly co-sponsored the Adams bill. According to documents CMD obtained from public record requests in Ohio, a draft bill was sent to Adams on January 23, from Steve Dimon of 21 Consulting LLC, who represents TransCanada. The bill was sent as an attachment to the Dimon email. The email message itself simply read, "Thank you so much!" Dimon stayed in touch with Adams' office over the proceeding months, providing his staff with further materials about Keystone XL, including a set of talking points stamped with the TransCanada logo. By February 14, Adams had an updated draft that had been reviewed by the Ohio legislative service commission, the non-partisan body that assists legislators with drafting legislation. Adams staffer Ryan Crawford sent this language to Rob Eshenbaugh, a lobbyist with Ohio Petroleum Council, the state affiliate of the American Petroleum Institute. "Please let me know if I can be of further assistance," Crawford wrote to the lobbyist. Eshenbaugh responded with some requested changes, which Crawford then incorporated into the bill. All this occurred prior to Adams sharing the bill with his fellow legislators, which didn't happen until February 20. Adams finally introduced his bill in the Ohio Assembly on March 9, without any public statement about his involvement with the ALEC Academy or that the source of the bill was a tar sands lobbyist. The route of the proposed KXL pipeline takes it through Montana, South Dakota, Nebraska, Kansas, Oklahoma, and Texas. This is a long way from Ohio, but the debate over the KXL project has become a national issue. The ALEC Academy, and subsequent lobbying from the oil-industry, demonstrates that TransCanada sees value in developing a list of states supportive of the project to influence the federal debate over KXL approval. The precise details of the ALEC tour, including the trip being part-sponsored by TransCanada, are not mentioned in Adams’ financial disclosures, which only reports his expenses as being from ALEC and the Alberta Government. Adams is not breaking the law here. This is because of the way ALEC works to fund legislator travel. Its scholarship system allows corporations to “sponsor” legislator’s expenses, which are then simply disclosed as being a payment from "ALEC" and not from the sponsoring corporations or groups. CMD documented the ALEC scholarship fund in a 2012 report released jointly with Common Cause: "How the American Legislative Exchange Council Uses Corporate-Funded “Scholarships” to Send Lawmakers on Trips with Corporate Lobbyists." Graduates of the Keystone Academy appear to be learning a lot about how ALEC works behind the scenes to promote special interest legislation while keeping the public entirely in the dark. New Documents show Exxon knew of contamination from the Maryflower oil spill, still claimed lake was "oil-free"
On March 29 ExxonMobil, the most profitable company in the world, spilled at least 210,000 gallons of tar sands crude oil from an underground pipeline in Mayflower, Arkansas. The pipeline was carrying tar sands oil from Canada, which flooded family residences in Mayflower in thick tarry crude. Exxon’s tar sands crude also ran into Lake Conway, which sits about an eighth of a mile from where Exxon’s pipeline ruptured. The cove of Lake Conway which Exxon claimed was "oil-free"
A new batch of documents received by Greenpeace in response to a Freedom of Information Act (FOIA) request to the Arkansas Department of Environmental Quality (DEQ) has revealed that Exxon downplayed the extent of the contamination caused by the ruptured pipeline. Records of emails between Arkansas’ DEQ and Exxon depict attempts by Exxon to pass off press releases with factually false information. In a draft press release dated April 8, Exxon claims "Tests on water samples show Lake Conway and the cove are oil-free." However, internal emails from April 6 show Exxon knew of significant contamination across Lake Conway and the cove resulting from the oil spill. When the chief of Arkansas Hazardous Waste division called Exxon out on this falsehood, Exxon amended the press release. However, they did not amend it to say that oil was in Lake Conway and contaminant levels in the lake were rising to dangerous levels, as they knew to be the case. Instead, they continue to claim that Lake Conway is "oil-free." For the record, Exxon maintains that the "cove," a section of Lake Conway that experienced heavy oiling from the spill, is not part of the actual lake. Exxon maintains this distinction in spite of Arkansas Attorney General Dustin McDaniel saying unequivocally "The cove is part of Lake Conway…The water is all part of one body of water." Furthermore, Exxon water tests confirmed that levels of Benzene and other contaminants rose throughout the lake, not just in the cove area. Though Exxon was eventually forced to redact their claim that the cove specifically was "oil-free," the oil and gas giant has yet to publicly address the dangerous levels of Benzene and other contaminants their own tests have found in the body of Lake Conway. The Environmental Protection Agency and the American Petroleum Institute don’t agree on everything, but they do agree that the only safe level of Benzene, a cancer causing chemical found in oil, is zero. Benzene is added to tar sands oil to make it less viscous and flow more easily through pipelines. Local people have reported fish kills, chemical smells, nausea and headaches. Independent water tests have found a host of contaminants present in the lake. Dead fish in Palarm creek, which Lake Conway drains into. Palarm creek is a tributary of the Arkansas River. According to Exxon’s data, 126,000 gallons of tar sands crude oil from the pipeline spill is still unaccounted for. Exxon's spill emanated from the Pegasus Pipeline, which like the proposed Keystone XL pipeline, connects the Canadian Tar Sands with refineries in the Gulf of Mexico. As many people who watch the oil industry know, oil spills are not avoidable, preventable, or unlikely. From extraction to combustion, oil is a destructive and dirty business, based on sacrificing the health of environments and peoples for corporate profits. This fact was especially evident last week, when Exxon’s Pegasus pipeline spilled over 150,000 gallons of toxic tar sands crude oil into Lake Conway and adjoining neighborhoods in Mayflower, Arkansas. However, Exxon’s Mayflower spill is not an isolated incident. In fact, there were three other significant oil spills that occurred last week. The spills, which were the result of both train derailments and pipeline ruptures, spilled many hundreds of thousands of gallons of toxic crude oil in and around neighborhoods, marshes, and rivers. Last week's cacophony of oil industry irresponsibility began with a train derailment in Minnesota, which spilled 30,000 gallons of crude oil. The oil was from Canada which has become a top exporter of crude to the United States because of their exploitation of the tar sands in Alberta. "It should be clear that we need to move more oil by pipeline rather than by rail or truck...This is why we need the Keystone XL. Pipelines are both safe and efficient." 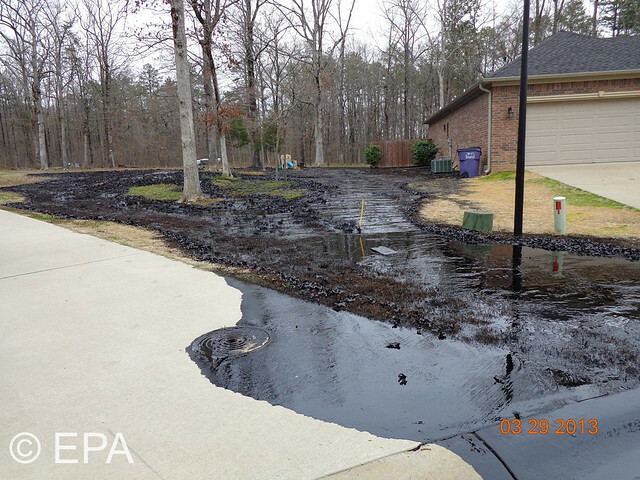 In an incident that should make anyone question the "safety and efficiency" of oil pipelines, Exxon’s Pegasus Pipeline spilled 157,000 gallons of tar sands crude into Lake Conway and surrounding neighborhoods in Arkansas. Since the spill, Exxon has limited press access to the spill site, oiled animals, and even the skies above the spill area. Exxon has even claimed that Lake Conway has been unaffected by the oil spill, though Arkansas Attorney General Dustin Mcdaniel has set that particular record straight. "Of course there's oil in Lake Conway"
Four days after Exxon's Pegasus pipeline ruptured and seven days after Keystone XL pipeline proponents claimed "pipelines are both safe and efficient," a Shell pipeline running through a bayou outside of Houston spilled 30,000 gallons of oil into the Texas marsh. The actual amount of oil spilled by Shell's West Columbia Pipeline is still unknown, as the cause of the leak has not been released by Shell. At the same time that Shell was spewing oil into the wetlands of Texas, a train derailment in White River, Ontario was leaking oil in Canada. Most people know White River as the original home of Winnie the Pooh, but it is also a major train depot for shipping crude oil. The company responsible claimed that 4 barrels of oil were spilled, though the actual number turned out to be 10 times larger, at 400 barrels. That's 16,642 gallons of toxic crude oil. Sorry Winnie. If built, the Keystone XL pipeline will spill. Stop the Keystone XL pipeline.